Yesterday we reported that Hollywood legend and star of the Halloweentown movies Debbie Reynolds has died following a stroke on Wednesday, Dec. 28, just one day after the tragic loss of her daughter, Carrie Fisher (Star Wars, The ‘Burbs), and today Reynolds’ Halloweentown co-star Kimberly J. Brown has written a touching tribute to her on-screen grandmother. Reynolds broke out with her role as Kathy Selden in Singin’ In The Rain and she was nominated for a Best Actress Academy Award for The Unsinkable Molly Brown (1964), but to younger audiences, she will always be lovingly remembered as Grandma Aggie Cromwell in the 1998 Disney Channel original movie Halloweentown. She returned to the witchy role in three sequels – Halloweentown II: Kalabar’s Revenge (2001), Halloweentown High (2004), and Return to Halloweentown (2006) – and she opened the gate to Halloween for a generation of kids. Kimberly J. Brown co-starred as Aggie’s granddaughter Marnie in the first three Halloweentown films. Yesterday, Brown posted a lengthy remembrance of Reynolds on Facebook, which you can read below. What do you say about a woman who had such an impact on your life both professionally and personally? Debbie lived her life like all of us should, to the fullest. She was bold, funny, and had the biggest heart. Her sparkly smile warmed every room she was in, and her jokes about her amazing career and life would make your stomach hurt with laughter. Making people happy through her performing was her favorite thing to do, and she showed me at a young age what a gift it is to be able to do that for people. She was so talented and wise, which easily could have gone to her head, but instead she went out of her way to help others shine as brightly as they could. She’d try to move huge ladders on set just to help the crew, and looked out for every actor no matter the size their role. Her humility, grace, and care for others inspired me so much as a teen and is something that will always stay with me. “Being normal is vastly overrated” is a quote from “Halloweentown,” and how fitting it is that her character spoke it. Her generosity, talent, and loving spirit made her anything but normal. Thanks for the magic, Debbie. Rest in peace. As first published on Variety, Brown also wrote the following tribute to Debbie Reynolds. 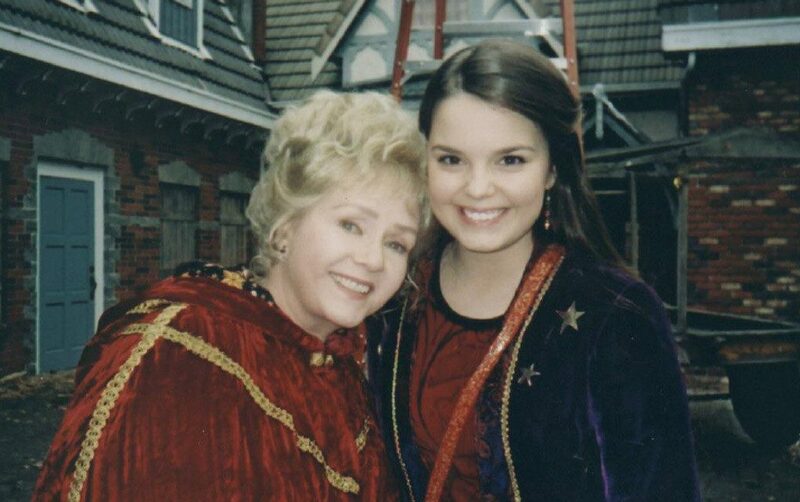 I was 13 years old when I first booked “Halloweentown” and met Debbie. Little did I know it was only the beginning of some amazing adventures together. I knew in that first moment of finding out I was going to play her granddaughter that getting the chance to work with such a legend was a once-in-a-lifetime opportunity. One movie grew to three movies and many more years of friendship. I am beyond grateful for my time spent working with her and being touched by her special spirit. She was the best. I remember not being sure what to expect when I first met her. She had been in the business so long — you never know how certain celebrities will behave when you meet them in person. She quickly dispelled any nerves with her giddy grin. She was the warmest and the kindest. I appreciated that she always treated me like a peer, even at 13, encouraging me with that twinkle in her eye along the way. As I grew older and we worked together more, her jokes and stories became a little bawdier and I was riveted. She loved sharing wisdom and making you laugh at her own expense. It made her day to make someone else happy. I was always in awe of her fierce spirit. She had that unique ability to stand up for what she believed in all while doing it with such grace and respect for others. Whether it was a crew member, fan, or fellow actor, everyone mattered to her and she made sure they felt appreciated. That always stuck with me. In the years after we finished working together, I had the pleasure of seeing her variety show a few times in different states and visiting with her at her house. She had so many fans of different generations. She’d come out on that stage and people would go crazy! I would chuckle in admiration watching her. I was still amazed some 10+ years later that I got to be friends with this hilarious, generous, feisty lady. I could repeat so many stories and acting tips over the years of knowing her, but if I could pinpoint one of the biggest things she inspired me to always have, it was gratitude. She appreciated that after all the years of highs and lows in this crazy entertainment industry, she still got to come out, perform, and make people happy. She valued what a gift it is to be in that position, and no matter how famous she got, she did it with such humility and love. And that’s why she was loved by so many. Debbie Reynolds and Kimberly J. Brown on the set of ‘Halloweentown’.